Toe stub injuries and fractures: due to lack of protection. If you sweat excessively: Open-toed shoes will ensure your feet stay dry, particularly between the toes. This is important for preventing fungal infectionand maintaining skin strength. Public Showers: Always wear flip-flops when using a public shower like you would find at pool or gym locker room. 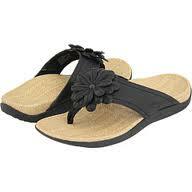 If the back of your heel is sore, flip-flops can reduce irritation to the area. If you are planning on wearing flip-flops, make sure you get a pair with a thick, rigid sole. This will strengthen your foot’s ability to absorb shock. Also, while you’re wearing them, make sure you take it easy on your feet to minimize injury. If you have questions on where to find a more rigid, yet stylish sandal, you can inquire at the First Coast Foot and Ankle Clinic.